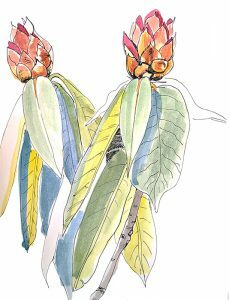 Due to the popularity of the Art in the Arboretum Exhibit at Polly Hill Arboretum last season, we will host an outdoor art exhibit again this year featuring artwork inspired by the plants and landscapes at the Arboretum. Have you taken photographs of the landscape, sketched a flower, or painted a vista of the Arboretum? We would like to portray the Arboretum through the eyes of artists using your botanical and landscape images from all seasons. Reprints of original artwork will be displayed at the Arboretum through the summer and fall. To submit digital photographs of your work for consideration or for more information, please contact Arboretum staff at [email protected]. If selected, staff will work with you to obtain high resolution photographs if necessary.